Mater Dei captures 2017 Battle at the Beach 7 on 7 championship. 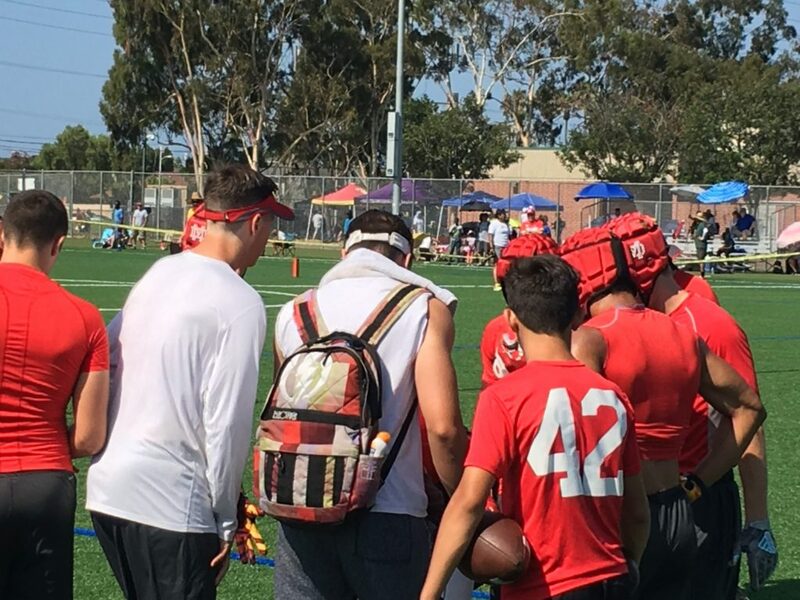 For the second straight year, Mater Dei won the Battle at the Beach 7 on 7 passing tournament at Edison High School in Huntington Beach, California. And, while nobody is surprised that the Monarchs topped the 20 team field, most would be surprised to find-out that Bruce Rollinson’s troops did it without three of their offensive stars — quarterback J.T. Daniels and wide receivers Amon-Ra St. Brown and Bru McCoy. Daniels, a junior who calls all of his own plays, served as Mater Dei’s offensive coordinator Saturday while taking the day off to rest his throwing arm. Mater Dei QB J.T Daniels (backpack) served as the Monarchs’ play caller on Saturday. Daniels took the tournament off to rest his throwing arm. It was the Monarchs’ defense that stepped-up in its 7-6 championship game win over Trinity League rival St. John Bosco in the Gold Division. While the victory doesn’t avenge last year’s CIF Southern Section Division 1 championship game loss to Bosco, it does set the tone for what should be one of a couple of meetings between the two national heavyweights during the 2017 season. In Daniels’ absence, Rollinson used sophomore Carter Freedland against the Braves. Freedland hooked-up with Nikko Remigio, who has given his verbal commitment to Cal, on the first drive of the Gold Division championship game giving Mater Dei a 6-0 lead. The difference in the game was the next play when tight end Mike Martinez used every inch of his 6-6 frame to make an outstanding one-handed catch on the extra point try. Bosco responded on it first drive with Iowa State-recruit Re-al Mitchell engineering a touchdown drive with a scoring pass to Jake Riley, however, the Braves missed the extra point try, which in 7 on 7 is an actual play, not a kick. After finishing 2-2 during pool play, Mater Dei entered the championship quarterfinals as the No. 8 seed. In the quarterfinals, the Monarchs beat top-seeded and fellow Trinity League foe Servite 20-14. Servite was a perfect 4-0 during pool play. In the semifinals, Mater Dei beat Paraclete 21-19 in overtime. St. John Bosco was 3-1 in pool play, losing to Paraclete. Bosco reached the championship round beating Cathedral 22-11 in the quarters and host Edison 20-12 in the semifinals. Look for both Mater Dei and St. John Bosco to be highly ranked when High School Football America releases its Preseason Top 100 on July 17. In the Silver Division championship game, Charter Oak defeated Bishop Amat 22-20. One surprise on Saturday was the fact that Corona Centennial finished 1-3 in pool play and didn’t advance into the Round of 16 gold and silver brackets.